Finding yourself daydreaming about an exciting life working as a model, designing clothes or jewelry, conceptualizing fashion events or being a stylist to the stars while in your office cubicle, listening to your Theology professor or in between housewifey chores? Here's another reason to look forward to weekends when you are free of your weekday responsibilites: Saturday classes at The School of Fashion & the Arts via their SoFA Fashion Capsules Series. The School of Fashion & the Arts invites you to meet, greet and learn from the country's top fashion experts and celebrities through a rare series of 1-day lectures & workshops. Classes will be conducted each Saturday from February to April. Get inspired as they reveal their tips, trade secrets, and insider experiences from various fields of creative work such as fashion design, photography, modeling, retail, events and styling. Here is a complete list of workshops and schedules. Participation Fee is Php 1,750 inclusive of materials and official SoFA certificate signed by guest mentor. Delve into the world of Fashion Photography through the eyes of noteable photographer Raymund Isaac. Learn how he captures priceless and amazing images. Acclaimed professional model, Marina Benipayo shares her secrets to success and how she continues to be one of the country’s most sought after fashion models. 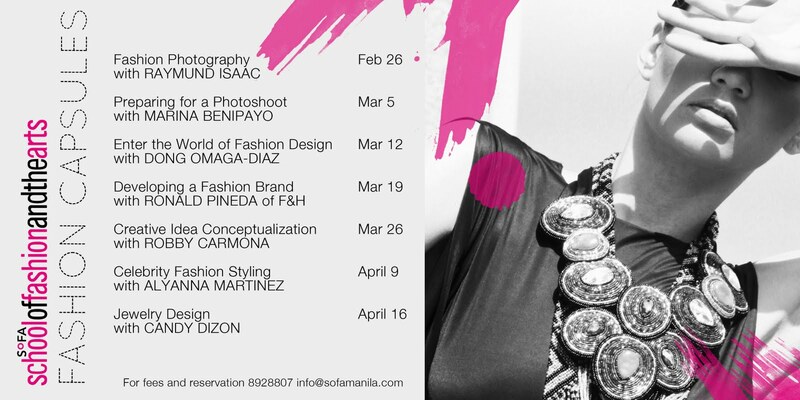 Fashion & Design Council of the Philippines (FDCP) former President, Dong Omaga-Diaz gives you access into his world. Find out if you have what it takes to be a fashion designer and learn about the creative design process. Yearning to start your own brand? Learn from the founder and president of Folded & Hung as he shares trade secrets and helpful tips to be a successful fashion retailer. -Grow your bazaar/tiangge brand to a wide scale mass retail label. Visionary fashion & event director Robby Carmona gives you a peek into his creative process. Squeeze out those creative, unique fashion juices to hone your thought patterns and stimulate new perspectives. Have a glimpse of the Celebrity Fashion Stylist’s life. Learn first hand from Alyanna Martinez stylist to stars such as Ruffa Gutierrez, Miriam Quiambao, Maricar Reyes, Solenn Heusaff & more. Find out how to be a stylist yourself and gain inside access to the secrets of the trade. Introduce yourself to the dazzling world of jewelry from one of the country’s premiere jewelers Candy Dizon of Jul B. Dizon in this rare opportunity. Their pieces have adorned countless celebrities and magazine covers such as Kris Aquino and Lucy Torres-Gomez. Educate yourself with the basic principles of jewelry design and the production process. See if you have what it takes to be a jewelry designer.